Have you found that there’s just not enough time in the day to do everything you need to do? 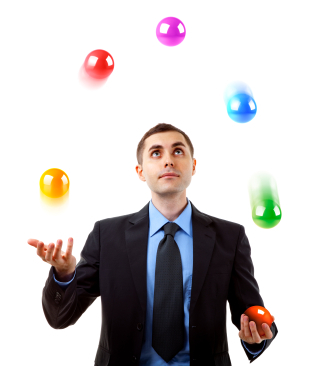 Finding yourself trying to juggle too much? Even when you’re looking for a job, there doesn’t seem to be a lot of time to focus on YOU. I was inspired last week by a Twitter friend at Syracuse University (@tracytilly) to submit 18 different tweets focused on the job search. Other participated as well. Search “#search18” on Twitter. When I started, I thought there would be no way I’d get to 18. Wrong. I could have gone a lot farther. Who knew? Do the research on the jobs/company/culture. Google it. Tell your family, then network. Use the resources available through your Career Center. Use Twitter – follow recruiters, participate in chats, network – I recommend #careerchat and #jobhuntchat to get you started. Use LinkedIn – follow companies, connect with recruiters, join & participate in groups. Don’t know how? Learn here. Take some “you” time to relax and refocus so there’s no burnout. As always, thanks for reading. Have a great week! Great Advice! I would like to add on #12 that you follow all recruiters, not only the ones in your field. Recruiters are using twitter more and more to promote not only their on openings, but their friend and coworkers as well. So while you maybe an Accountant, you could get a lead off of a technology recruiter. Thanks for the comment, Mark. That is a great addition! You’re absolutely right – you never know who will have the next opportunity of a lifetime.